Danish people would never expect that the oyster crisis confronting their country may turn into a food-lovers' bonanza in China. The European country's dilemma may be the last thing Chinese people would ever understand as they see the abundance of seafood as a treat, rather than a problem. 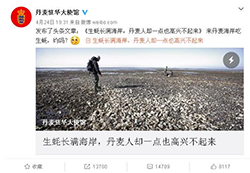 The Danish Embassy published a story on Monday evening on its official Sina Weibo account, China's twitter-like social network, about the problems for their country caused by an invasion of the exotic oysters. Chinese internet users enthusiastically responded with much discussion about ways to address the issue on Weibo, then WeChat, another popular social media network. Apparently, when it comes to eating, Chinese people are very serious and they already started to make plans for their oyster journey. The most popular comment came from someone suggesting oyster visas should be issued "with 10 years' unlimited round trips and one-month-long stay and I can eat up them all in five years" received over 10,000 likes. The Danish Embassy is very grateful for Chinese people's innovative advice such as building oyster sauce factories and organizing oyster-dining journeys. It also said as long as China permits, they'd love to export oysters to China.